An article published in the journal “Monthly Notices of the Royal Astronomical Society” describes a research about the possible formation of large moons following the collision of two planets. 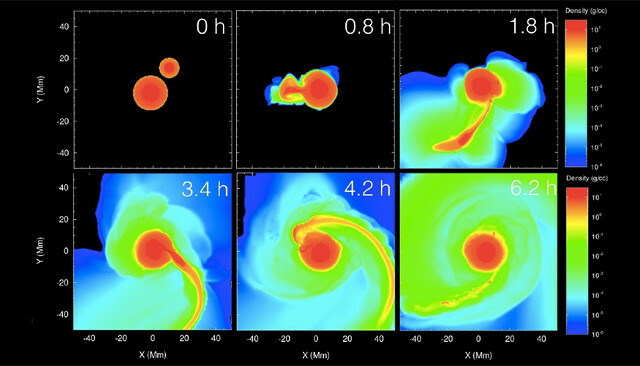 Megan Bruk Syal and Amy Barr of the Lawrence Livermore National Laboratory conducted a series of simulations to understand what factors influence the birth of big moons. This study offers new hope in the search for exomoons orbiting exoplanets studied with NASA’s Kepler space telescope. The first exoplanets were discovered in the ’90s and since then continuous progress have been made in the techniques of identification and recognition of false signals due to other phenomena. Currently, more than 3,500 exoplanets have been confirmed and other candidates are under study. You can expect that at least a part of them has one or more moons but so far none has ever been identified. Some years ago the astronomer David Kipping founded the Hunt for Exomoons with Kepler (HEK) program, affiliated with the Harvard-Smithsonian Center for Astrophysics, which has precisely the purpose of searching for exomoons using the observations made by NASA’s Kepler space telescope. This is the most important exoplanet hunter in the history – only at its beginning – of this branch of astronomy with more than 2,300 of them already confirmed so the idea is that it’s more likely that its data might reveal the presence of some moon orbiting one of many exoplanets discovered. Despite great progress, the identification of an exoplanet is still a complex problem, especially if it’s a rocky planet, which can have mass and size comparable to that of the Earth. Identifying a moon in orbit around a planet in another solar system is even more difficult but a moon that’s fairly large compared to its planet could provide enough clues of its existence to reveal it in the Kepler space telescope’s observations. Earth has a very large satellite and according to the most likely models is the result of the collision of a planet the size of Mars with the early Earth. How likely are such events? What are the factors that after a collision like that determine the birth of a big moon? Megan Bruk Syal and Amy Barr tried to do some simulations to try to understand it. This type of study is not new, exactly because other scientists wanted to understand the origin of the Moon after the possible impact of a planet with the early Earth. In this new research multiple scenarios were considered for a possible impact given that it concerns a generic planetary impact that could lead to the birth of a satellite much more massive than the Moon. This minimum limit is due to the fact that it’s estimated that a satellite should have a mass at least 10% of Earth’s for the Kepler space telescope to be able to detect it. The Moon has a mass that is 1.2% of the Earth’s therefore a space telescope like Kepler could possibly detect it from the Alpha Centauri system, just over 4 light-years away, but not from a solar system farther away. The new simulations indicated that in addition to impact angle and the masses of the objects that collide another critical factor is impact velocity. A collision between two planets with masses between 2 and 7 Earth’s masses at an oblique impact angle and a speed close to escape speed could launch into orbit enough mass to create a satellite massive enough to be detected by the Kepler space telescope. As all studies conducted by creating computer simulations, the results need to be verified. It’s a very complex research at the limits of the current instruments’ possibilities. However, in the last 20 years the situation in the studies of other solar systems has changed a lot and probably in the near future there will be more big progress.